While I am not very happy that the second trailer gives away the demolition of the original A-Team van, I have to say this trailer keeps my excitement fairly high. The cast looks to have nailed the vibe of the original characters and the movie looks to have done a good job of bringing the concept current with tons of action. I especially love the part with B.A. whistling the original theme, nice touch! I gotta say, I am NOT a fan of this poster. Number one, B.A. Baracus looks like he's mid crap and number two, its boring. This poster does nothing for me. Why not a group shot versus these four close-ups made into one poster. Pretty bad. Oh well can't win them all. 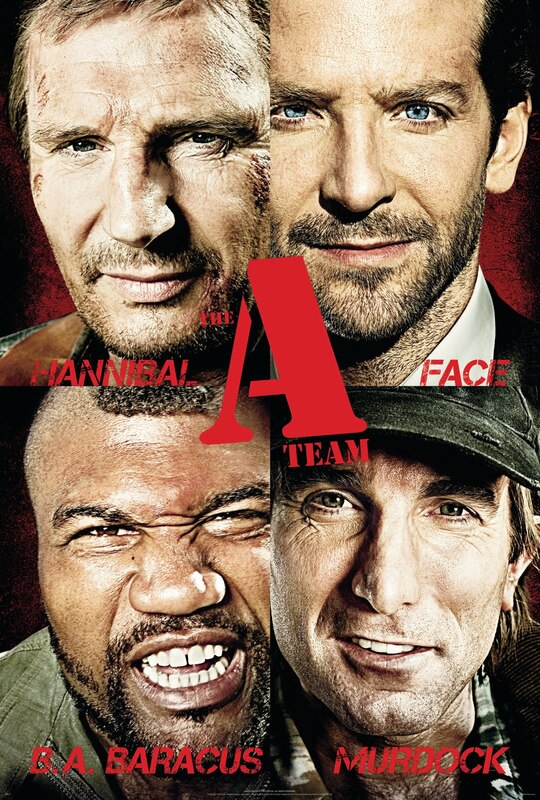 Despite a lackluster poster, I can't wait for "The A-Team" to hit theaters June 11th. Yeah I dug the part with B.A. whistling too. Cool post!